Father: Jesse Franklin Ingels, Sr. 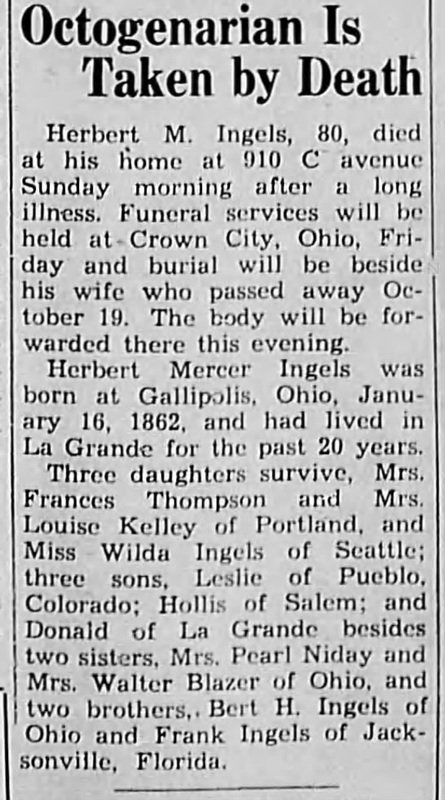 The body of Mrs. Herbert M. Ingles, who died last Monday at La Grande, Oregon, arrived at Huntington at 5:45 Sunday evening and was at once brought on to the Entsminger Funeral Home. There a final funeral service will be held at 2 o'clock Tuesday, with Rev. W. Scott Westerman officiating. Interment will be made at Clay Chapel. Neither the husband, who is in poor health, nor the children were able to accompany or precede the body. Mrs. Ingels was formerly Emma Bay, a daughter of Thomas and Louise Bay and was born and reared at Crown City. Mrs. Ingels was in her 74th year, her birthdate being Jan. 1869. Before her marriage in 1888, she taught in the county schools. In 1902, the family located in the west, first in Colorado and thence to Oregon where they had since resided. An invalid for ten years, Mrs. Ingels came back a few years ago for a visit and relatives here have remarked on her cheerfulness and optimism, not withstanding her physical disabilities. It was requested that her body be brought back to rest by that of her oldest son at Clay Chapel. JESSE INGELS- who was born in Uniontown, Fayette county, Pennsylvania, August 6, 1811 is a son of George and Mary (Ramey) Ingels. Hew was married October 27, 1850, in Gallia county, Ohio, to Mary A. Waddell, who was born in Gallia county, June 28, 1830, a daughter of William and Elizabeth (Hughes) Waddell. Their Children are: Sarah A. (Clark), born October 24 1851, resides in Clay township; Jasper C., March 21, 1855, in Green township; Ella R., September 10, 1857, in Clay township; Jesse F., December 181859, in Clay township; Herbert M., January 16, 1862, in Harrison township; Berton H., January 11, 1865, in Harrison township; Ina C., October 4, 1866, died August 24, 1868; Alwilda P., July 11 1869, in Harrison township; Lyda L., December 9, 1875, in Harrison township. Mr. Ingels was sheriff of Gallia county four years, justice of the peace four years, captain of Independent Company, Rifle Regiment, five years, and colonel of the same two years. He settled in this county in 1834, resides in Harrison township, and is engaged in farming. Postoffice address, Thivener.